Writer and naturalist Leslie Sharpe talks about her new book, The Quarry Fox and Other Tales of the Wild Catskills. Then we air part of my 2007 interview with David Gessner about his book, Soaring with Fidel: An Osprey Odyssey from Cape Cod to Cuba and Beyond. When people think of the Catskill Mountains of New York state, many of them think of the so-called Borscht Belt, also known as the Jewish Alps. The Catskills were and in some cases still are home to famous Jewish resorts like Grossinger’s where many beloved American comedians got their start. But that’s the eastern Catskills. The great western Catskills are lesser known and less developed, a region still home to wilderness. Writer and naturalist Leslie Sharpe has long made that wilderness her home. 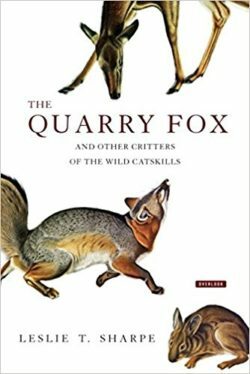 In her latest book, The Quarry Fox and Other Tales of the Wild Catskills, she trains her keen eye and narrative gifts on the creatures with whom she shares her rugged landscape: the owls, bears and foxes among others that weave the web of life around her. Sharpe’s scientific observations join with her deeply felt connection to these creatures to give us an appreciation of the beauty of the Catskills and her camaraderie with its animals. Leslie Sharpe is an environmentalist, naturalist and writer. She is former Vice President of the New York City Audubon Society, the author of Editing Fact and Fiction: A Concise Guide to Book Editing and has written for many publications, including Newsday and Psychology Today. In 2007 I spoke with naturalist, environmentalist and author David Gessner about his book Soaring with Fidel: An Osprey Odyssey from Cape Cod to Cuba and Beyond. We air an extended excerpt from that interview today. Hear the whole interview, as well as others we’ve done with Gessner about his other books over the years.